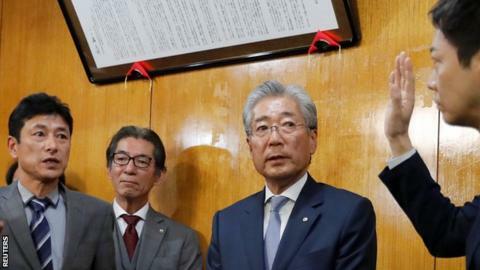 The head of Japan's Olympic Committee (JOC) is stepping down over corruption allegations relating to the awarding of the 2020 Games to Tokyo. Tsunekazu Takeda is being investigated by French prosecutors who are looking into claims a 2m Euro (£1.7m) bribe was paid to secure Tokyo's winning bid. "I don't believe I've done anything illegal," Takeda said as he announced he would not seek re-election. "It pains me to have created such a fuss, but I believe it is my responsibility to serve out the rest of my term," he added. Takeda's tenure ends in June. The Japanese government has always insisted its Tokyo bid is clean. The company to which the payment was made is linked to the son of former world athletics chief Lamine Diack, who was a member of the International Olympic Committee when it awarded the Games to Tokyo and is the subject of corruption allegations being looked at by French investigators. The son, Papa Massata Diack, also faces corruption allegations - which he denies. A JOC panel has already cleared Japanese bidding officials of any illegal activity in the case, their 2016 report said the payment was a legitimate one for consulting services. Mr Takeda is a veteran Olympics official who competed as a show jumper in 1972 and 1976. He has been JOC president since 2001. The IOC said: "We take note with the greatest respect of the decision taken by Mr Takeda to resign as an IOC member.